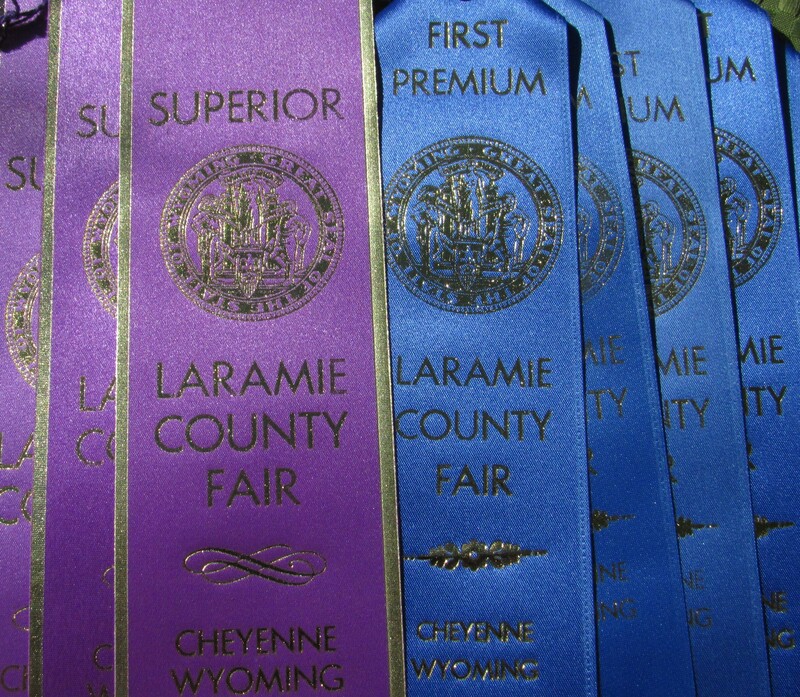 Fair entries winning a first premium get a blue ribbon–and a check for the amount of the premium: first is $6, second is $4 and $3 for third. If you grew up in town, you might not realize any Laramie County resident can enter the Laramie County Fair. This year, the fair is set for July 27-Aug. 9, but now is the time to start planning what you’re going to enter. “I thought you had to be from a farm. I thought it was all 4-H, but these were people like me” Timi Saville, Laramie County Master Gardener, said of her revelatory experience at the Park County Fair in Powell some years ago. The following year, her Mexican Hats, a type of coneflower, won a blue place ribbon. Open Class refers to all the fair competition categories open to the public. Besides the crop and livestock departments, there are also Open Class departments in art, crafts (everything from wood and metal work to jewelry), culinary, needlework and photography. Since this is a gardening column, we’re going to look at how to enter in the Horticulture Department–fruits and vegetables–and the Floriculture Department–flowers and house plants. Your work will be judged by experts. That sounds stressful to some, but this is actually an opportunity to get some free advice, since it doesn’t cost anything to enter items in our fair. And there’s community recognition, possibly causing WTE columnists to call you for pointers on entering the fair. And there are the ribbons and premiums. In fair language, premiums are prize money. At our fair, first premium equals $6; second premium, $4, and third premium, $3. If there are 10 plates of cucumbers competing, it is possible that all 10 entries could qualify for first premium—or none may qualify. But premiums checks can add up to seed money or more if you enter several items. The very best plate of cucumbers will get a purple “superior” ribbon for that class. And of all the people with purple ribbons in the Horticulture or Floriculture departments, someone will become Reserve Champion and someone Grand Champion. So, are you in? You are? Good. Now let’s demystify the process of entering the fair. 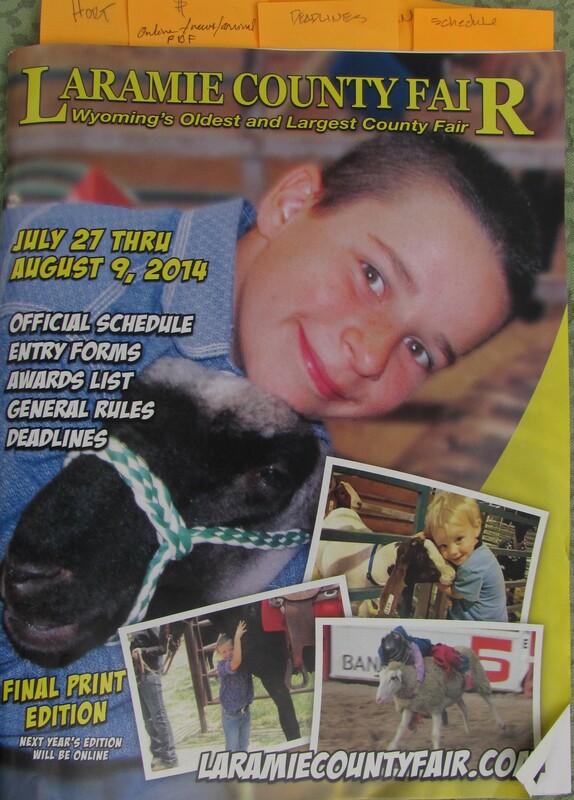 This is the final year for a print version of the Laramie County fair book. It is already available online. This is the final year the Laramie County Fair is printing the 120-page book available at local agricultural supply businesses like Murdoch’s, the University of Wyoming Extension office, 310 W. 19th, Suite 100, or the office at the Archer fairgrounds, 3967 Archer Parkway (I-80 Exit 370). The book is available online at www.LaramieCountyFair.com as a PDF. You may have to look for the link under News/arrival (of fair book). Turn to page 46 for Horticulture and page 52 for the Floriculture departments. Catherine Wissner, superintendent of the Horticulture Department, advises you to checkmark each class that you have the remotest chance of having a plant, flower, fruit or vegetable that would qualify. Early in the season, when entry forms are due, she said it is hard to know what will be ready at fair time. If you enter a category but end up not having an entry ready—it’s all right—it didn’t cost you anything but the time to fill in one line of the form listing all your entries. Also check out the Fair Fun contests on page 10, which are open to everyone. There are seven in all, everything from scarecrow building to pie baking contests. The entry form is on page 21. Horticulture and floriculture entries are static entries—because unlike livestock, they don’t move. Find the form on page 117 and 118. Only children need to fill in the age information and have their parents sign. –OR mail the form to 3967 Archer Parkway, Cheyenne, WY 82009. Step 4—Pick up entry tags at Archer, July 24-25, 8 a.m. – 5 p.m.
Corrections can be made at this time, so check your tags over before taking them home. 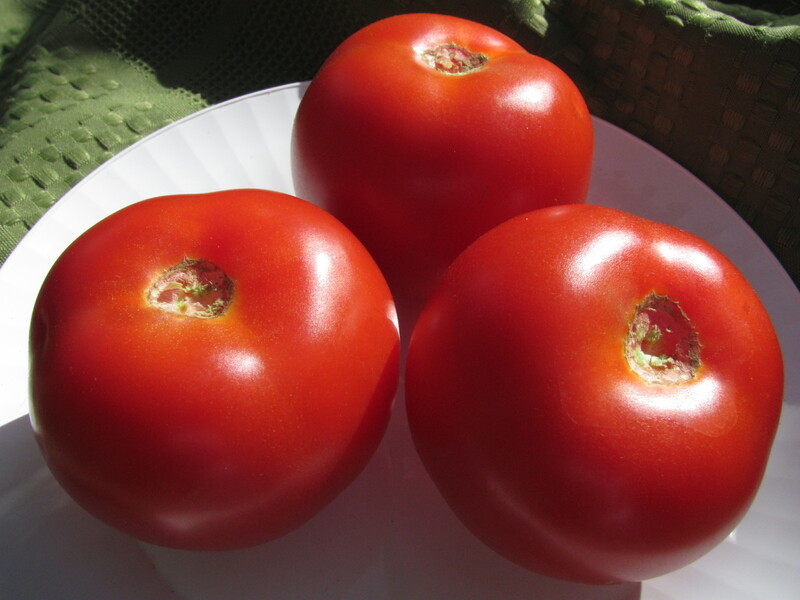 “Tomatoes – Specimens should be uniform in color, shape, and size, and free from cracks, sun scald and blemishes, ripe, solid and without stems.” Disclaimer: these tomatoes are from the store. While most Open Class departments accept entries July 31, noon – 8 p.m. (Culinary is the following Tuesday), Floriculture and Horticulture accept entries Aug. 1, 8 a.m. – noon. This means your tougher fruits and vegetables can be harvested the night before, and tender stuff early in the morning. Flowers should be hardened off the day before (see accompanying information). Timi Saville, who placed in nine of the 11 classes she entered last year, said to make sure you follow all the specifications. Read vegetable descriptions on pages 46 – 49 so you know exactly how to prepare each item. Once, her entry was disqualified because she only had four stems instead of the five required for chives—one got lost in the trip to the fair. “It might be a good idea to cut a few extra to have on hand in case a flower gets crushed,” she said. And bring extra water, she added. In Floriculture, the required flowers need to be in plain, clear glass or plastic containers. Any container not plain enough could disqualify the entry. Timi uses containers she finds at the dollar store or food jars with labels completely removed. House plants are fine in their regular pots. For vegetables, you will need a plain white paper plate with the entry form taped or stapled to it. Make sure your entries are very clean—sometimes judging requires tasting. On Aug. 1, 8 a.m.-noon, head over to Frontier Park, where you will pass your entries over to fair volunteers who will set them on display. Judging is Aug. 1, 1 – 5 p.m. and is closed to the public. The Floriculture and Horticulture entries are on display between judging and release of entries. During the fair, the Exhibit Hall is open to the public 9 a.m. – 9 p.m. Entries in these departments will be released Aug. 4, 5-7 p.m.
You’ll want to collect your ribbons, vases, potted plants and any of your fruits and vegetables that are salvageable. Other static open class entries are released Aug. 9. Premium checks are usually available when other open class entries are being released at the Exhibit Hall, which is Aug. 9, 3-5 p.m. If you don’t claim your check, it will be mailed to you. You do not need to enter a county fair to enter Open Class at the state fair, which will be held in Douglas Aug. 9-16. Horticulture and Floriculture entries can be delivered Aug. 9 or 10, 10 a.m. – 6 p.m. Pre-entry is not necessary, but there is a $1 processing fee per entry. Explore your options at http://www.wystatefair.com. It is generally recognized that afternoon–especially cutting in late afternoon, when the greatest amount of sugar has ascended into the leaves and blooms–as well as a “hardening off” process, will help insure a winning entry. Flower stems should be cut cleanly at an angle with a sharp knife or pruning shears and plunged into deep, hot water: 110 degrees Fahrenheit is ideal. Plunging plants up to their necks in cool water works as well. It is a good practice to carry a bucket of water to the garden and to place each cut specimen in the water at once. Lightly crush the base of woody stems on plants such as lilacs to improve the intake of water. Some flowers, such as Dahlias, Euphorbias and Poppies, need to have the cut tips seared over an open flame. Following cutting and water treatment, specimens should be placed in a cool, darkened room. After several hours, when the water has come to room temperature, add ice to the water and leave the flower material undisturbed overnight or place flowers in a refrigerator or cooler at a temperature between 38 and 40 degrees for six or more hours before they are to be shown. Flowers prepared in this way improve their substance and will hold their freshness longer. Categories: Entering the fair, Flowers, Vegetables | Tags: Cheyenne, fair premium, floriculture department, hardening off flowers, horticulture department, Laramie County, Laramie County Fair, Wyoming | Permalink.